Noble International school is the closest building to the British embassy in Ethiopia. The British embassy in Addis Ababa and the contact details have been listed below. These include their telephone number, email address and also their street address. 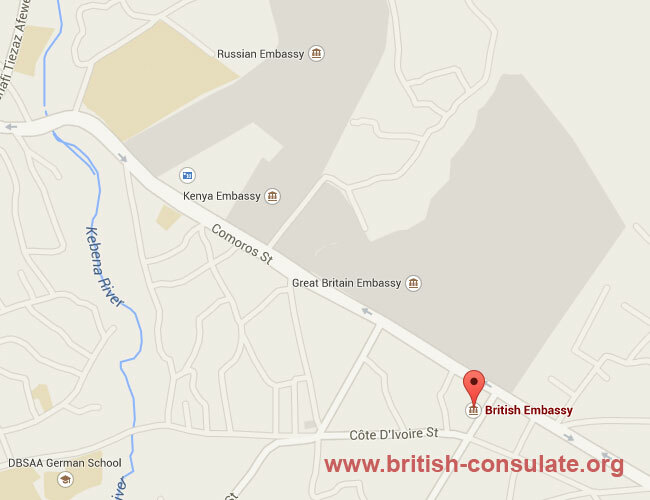 We have also added a map to the British embassy in Addis Ababa. If you need to apply for a passport or renew your current British passport then the embassy will be able to assist you. You can also apply for a British Visa in Addis Ababa if you are from Ethiopia and want to visit the UK or you can also apply for a marriage visa or a fiancee visa if you are married or engaged to a British national. Speak to the staff at the embassy as listed below for more information. Note that this Embassy manages all the affairs for Ethiopia, Djibouti and Somaliland.